Good headphones are essential, especially for travelers. Whether they’re for running, taking work calls, or drowning out airport noise, travel-friendly headphones are easily a must-have item on any trip. In fact, I always have headphones within reach, even when I’m staying local. Because I work remotely, I need to be able to take a call or narrow my focus wherever I am. So regardless of whether I’m working at home, on the plane, or a noisy coffee shop, I find a good pair of travel-friendly headphones are worth the investment. that he loves so much he even uses them for naps. But I personally find them to be too big. They take up almost an entire pocket in his backpack, which can be critical space when you’re traveling. , I recently got my hands on a pair of RHA bluetooth® in-ear headphones. These are admittedly my first pair of wireless headphones because I’ve always been worried about having to charge another device. Awesome as they are, they’re unfortunately not quite perfect as travel-friendly headphones. Despite high sound quality overall, I noticed some crackling when the treble gets higher than usual. And charging is still one more thing to think about and keep handy when traveling. However, the price makes the RHA MA390 earbuds a good bargain for solid headphones. 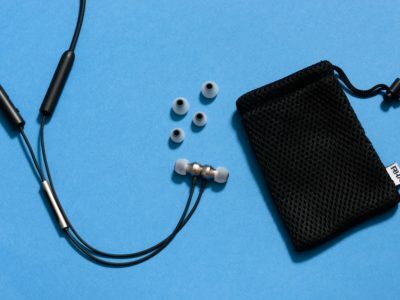 Do you have a favorite pair of travel-friendly headphones? Tell us about them in the comments!